The end of a year means two things; looking ahead at what's to come and looking back at the year that was. It has been a memorable year but I'm not here with a think piece on setting resolutions and pressing replay on its best moments. What I'm here for is a round-up of the best items I've used in 2018 which are good enough to take with me to 2019. 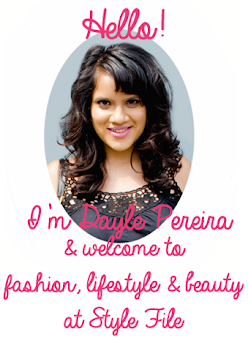 Through my job and ever-willing spirit to try something new, I've experienced a plethora of makeup, skin and lifestyle products. While most have been good, a select few have gone on to outshine the rest. These are 7 things I've enjoyed using this year which delivered amazing results and ones I'll definitely be using more in 2019. At the start of the year, I decided that it wasn't worth spending hours applying makeup if the base beneath didn't stay put. After a few samplings, I settled on the Smashbox Pore Minimizing Primer. It goes on as a super soft formula that gives a powdery-blurry finish. For oily skin like mine, it has worked wonderfully to hold makeup firmly in place, even on the greasiest areas like the lids and cheeks. It's pricey but you only end up using a smidgen for each application. My only regret is purchasing the pore minimizing variant, which I got talked into buying by the store person even though pores aren't a concern of mine, oiliness is. You can purchase the Smashbox Pore Minimizing Primer for Rs 3100 for 30ml. Frequent visitors on Style File may remember that my Fitbit journey began more than 2 years ago and has only been getting stronger. Through the years, I've upgraded models, sported various straps and always found the brand's customer service to be the finest I've ever dealt with. This year, my loyalty and adoration went a step further when I bought the Fitbit Versa. 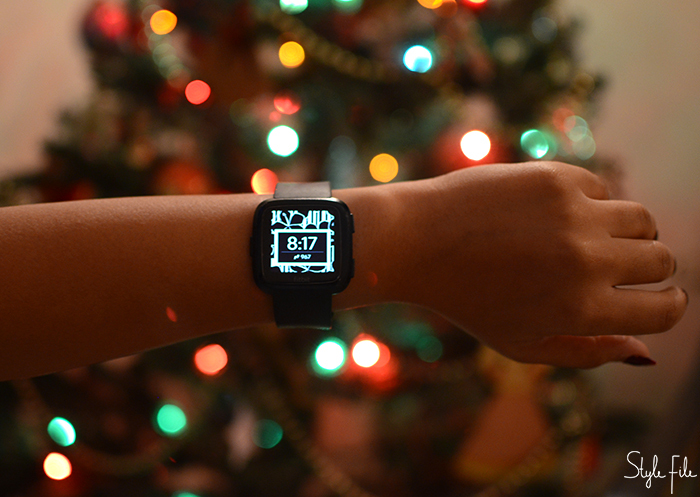 It satisfied my itch for a smart watch that paired sleekly with all my outfits. As this isn't a tech review, I'm not dwelling on specs but in a nutshell, it's the simplicity and beauty of tracking my runs, sleep cycle and even the weather on my wrist that makes this a winner. You can purchase the Fitbit Versa Smart Watch for Rs 21,999. 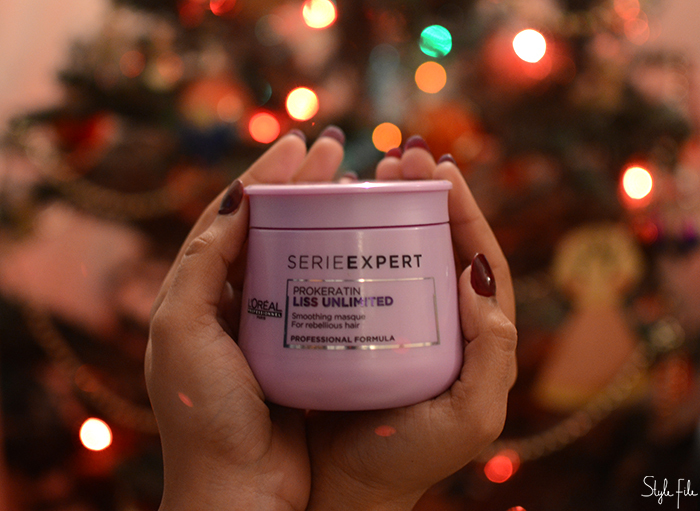 After a great salon treatment this year, I tried to replicate the results at home with the L'Oreal Series Expert Liss Unlimited Masque. The thick shimmery paste is to be applied on damp hair and needs only a few minutes to sink into the cuticle. I leave it for a tad longer to thoroughly penetrate the hair shaft. Even with consistent care, thick hair like mine tends to get rough and dry. This mask is a great fix with results and an incredible scent that lasts for days. You can purchase the L'Oreal Series Expert Liss Unlimited Masque for Rs 780 for 250ml. After unsatisfying results from a clarifying potion by an award-winning beauty brand that cost thousands, I was wary about products with similar claims. When Plum sent this one across, my hesitation was natural but short-lived when I actually began using it. As someone who has experienced the ravaging effect acne can have on one's skin (versus someone with already clear skin), I witnessed the Plum Green Tea Skin Clarifying Concentrate working wonderfully on my skin. It has a lightweight formula, doesn't irritate the skin and showed an improvement on dark spots and dullness over continuous usage over a month or two. If the almost-empty bottle pictured above isn't proof enough, I don't know what is. You can purchase the Plum Skin Clarifying Concentrate for Rs 1,175 for 30ml. Skin cleansing gadgets have always fallen in the 'will they, won't they' category for me. As in, will they actually do more than a face scrub or won't they be an expensive purchase that doesn't yield results. When the brand sent me the Foreo Luna Mini 2 Skin Cleansing Device all the way from their international HQ, I arrived at my verdict. You can find my in-depth review on NDTV Lifestyle but simply put, it gives my face a deeper, more hygienic cleanse without traditional bristles, hasn't troubled my skin and left it smoother and softer from the first use itself. With a steep price, it's definitely a skin care investment but one which I now can't do a day without. You can purchase the Foreo Luna Mini 2 Skin Cleansing Device for Rs 14,430. After adoring the fragrance of lavender scented beauty products, I went a step ahead and added the Aroma Magic Lavender Essential Oil to my routine. 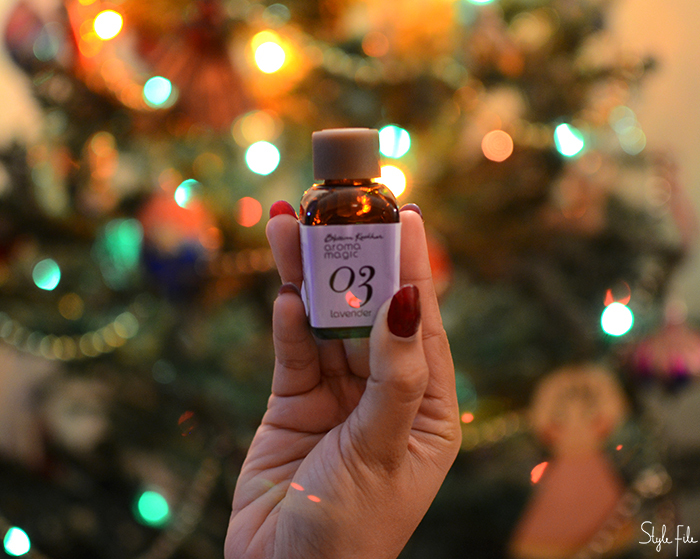 Known for its various skin and wellness benefits, this little bottle has a neat dispenser and doesn't break the bank. Even a drop or two is enough for a relaxing whiff and has found itself in many of my masks and hair packs. You can purchase the Aroma Magic Lavender Essential Oil for Rs 300 for 20 ml. As a child, I spent many summers poured over ghost stories and mystery novels. Unfortunately, it's a habit I fell out of as an adult and never picked it back up because of how hassling it can be to purchase books and lug around paperbacks. So the Amazon Kindle Paperwhite E-book Reader seemed like a natural choice for me. I purchased the newest edition of the reader which is waterproof, thinner and lighter with a backlight and slowly but steadily, I've found myself picking up the habit again. I'm no reading purist so I didn't miss the feel of paper between my fingers. The ease of finding books at my fingertips and reading in the dark before I sleep without straining my eyes has made this a clear winner for me. 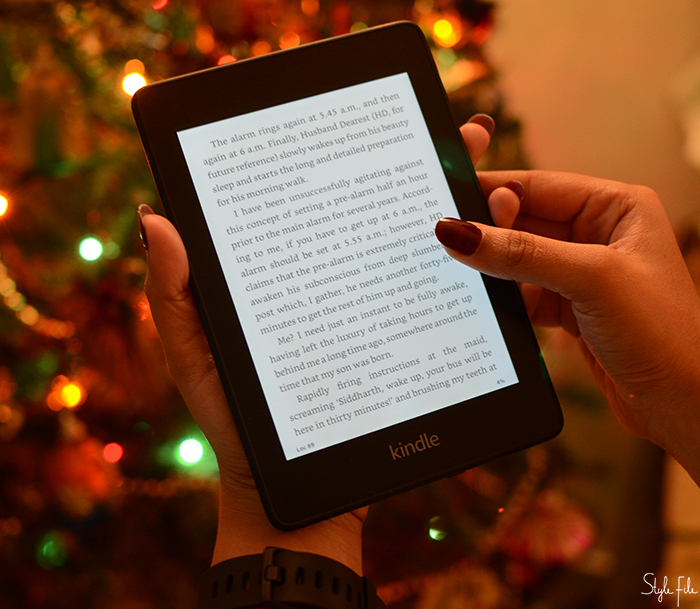 You can purchase the Amazon Kindle Paperwhite 10th Gen for Rs 12,999. On a separate note; for those who have noticed, I haven't been posting much on Style File and even when I have, the tone and nature of my posts have changed significantly. It's a deliberate choice that I've made for the blog; not only to explore my skill and thought process more but also because content about pretty outfits and new launches have kind-of reached peak saturation in the current digital climate. My intention when starting Style File almost 8 years ago was to write about what mattered to me, regardless of whether it got me followers or went viral. As I slowly get back to more regularity on Style File while balancing my job and the rest of my life, I'd like to thank you for reading what I have to say. Every single reader matters to me and I'm glad to have you on my journey. Cheers to a year that I don't think I could possibly forget and to the one that is to come! The clock struck 7. Me, and almost everyone in India (and the world, to be honest) who has even the slightest interest in Bollywood glanced anxiously at their home screens. A few refreshes later, it arrived. And by that I mean, Deepika Padukone and Ranveer Singh's first official photos as a married couple. After years of shipping and weeks of waiting, it wasn't a surprise that the coveted pictures went viral within seconds. But why? Marriages happen every day; even in the celebrity world. So what made this one so special? Apart from the fact that they are currently India's most loved celebrity couple, what further heightened the anticipation was that most of the affair was kept under wraps. Last December, Anushka Sharma and Virat Kohli made a quiet escape to Italy and returned as a married couple with the only intimation being pastel toned Sabyasachi clad wedding pictures on Instagram. 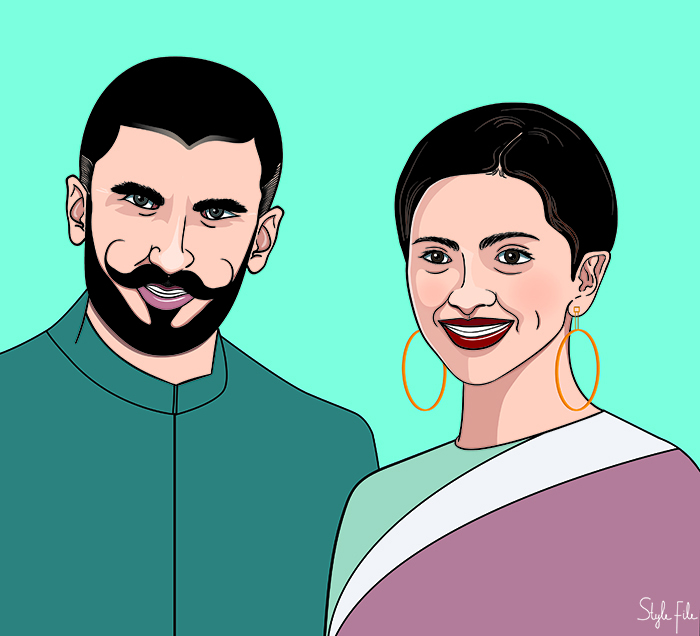 This year started off rather differently in Bollywood with updates of Sonam Kapoor and Anand Ahuja's summer wedding being readily shared online. But days later, maybe Neha Dhupia's surprise wedding to Angad Bedi should have been a telling sign that the secret shaadi was here to stay. Even Priyanka Chopra and Nick Jonas' union, which saw numerous ceremonies marrying Eastern and Western rituals, came to life in a select spread in People Magazine. For as long as I can remember, celebrity weddings in both Bollywood and Hollywood have had a reputation for being glitzy, larger-than-life and most notably, public. In 2012, Saif Ali Khan and Kareena Kapoor's regal wedding spanned across days with the country's finest in attendance. Two years later, Kim Kardashian married Kanye West in a lavish Italian wedding that included multiple designer gowns, a flower wall and 7 tier cake, all of which costed cool millions. In what could be considered a parallel universe, many quieter celebrity weddings have taken place since then. Lisa Haydon's 2016 hushed wedding to Dino Lalvani as well as Preity Zinta's vows to Gene Goodenough in the same year are proof. So was the surprising hush-hush marriage of Justin Beiber and Hailey Baldwin that took place months ago. It looks like Bollywood took a note out of their book to make their weddings incredibly opulent and luxurious but even more private. On one hand; exotic locations that have only been seen in movies, couture crafted by the world's most talented designers and close pals staying in posh suites. On the other hand—the one which we can see—a handful of pictures on social media that look like something out of a magazine. It's resplendent and magnificent and we're privy to only as much as they choose to show us. No paps or livecasts; just pictures that are worthy of being turned into a coffee table book. By no means is this a grouse or complaint; just commentary on the shift of the big celebrity wedding in Bollywood. The paparazzi may be unhappy with the trickle of precious wedding content and so may be the rest of the media. But at the end of it, the celebrity couples are making their wedding their own and driving up their following, who keep hitting refresh. Now all that's left is the anticipatory wait to see if the trend continues. That all starts by checking your mailbox to see if the next wedding invite has arrived.